Edited by terraclarke, 02 November 2018 - 06:50 PM. Besides the Jena Ziess, what would you say are next in terms of optical quality? Thanks Tony. They are all quite good, the orthos are the best tho. Edited by terraclarke, 02 November 2018 - 06:52 PM. 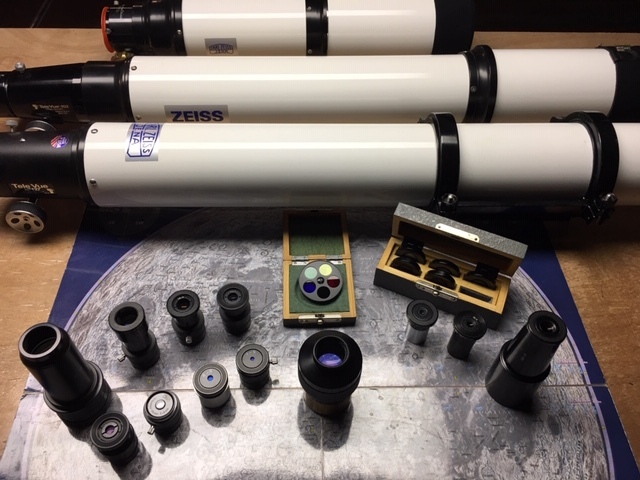 I really enjoy using my 0.965” eyepieces with my classic scopes and the CZJ Orthos are my favorites with my two Takahashi fluorite scopes. 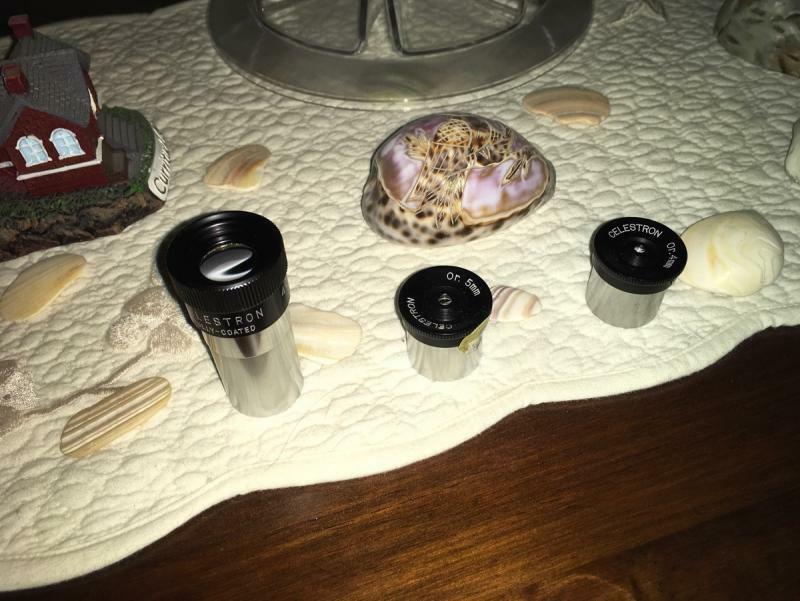 Side question related to the 0.965" eyepieces. 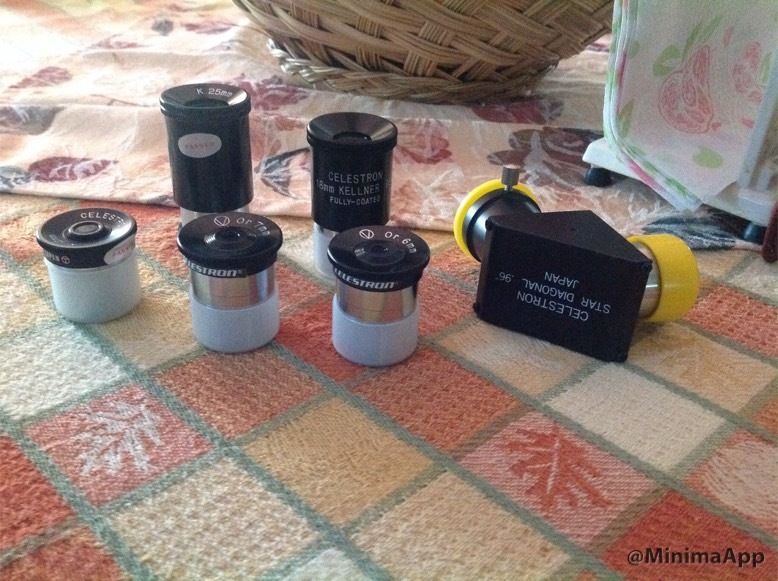 Do any of you that use 0.965" eyepieces also use them along with a 0.965" barlow? What's in the pretty box??? Who cares about the ep's, where dja get the box??? Between my Zeiss and Pentax .965's", my 1.25" ep's barely get any use for high power observing. Here's my Zeiss ep family, forgive the OTA's and 2" ep's but I wasn't going to reshoot this. Ortho's to the left, Huygens to the right and Wide in the middle. The O's and W get regular use, the H's not so much. The Meade 134 that Telescope Warehouse sells is really good. I can't reach focus with the barlow after the diagonal and it's about 2.6x before the diagonal. It works great with the 60mm f7 and 12.5mm Tani ortho. Too much magnification with the 5mm Orion. Next time out I'll try it with a recently acquired 9mm Criterion AR. I don't think I have ever seen a compression ring 0.965" diagonal. Who makes them? I'm an ex-carpenter who grew up to be a furnituremaker. I always set aside particularly nice pieces of wood for 'keeper' projects, like EP cases. 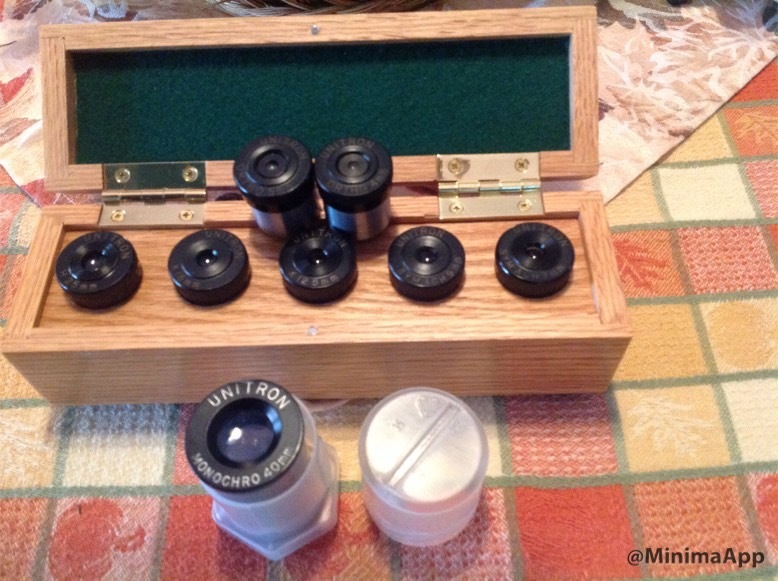 lovely looking set of eyepieces. What the one in the middle front row? Edited by Juha, 03 November 2018 - 01:34 AM. Takahashi used to make one. Good luck finding one, though. If you can stomach the cost, you could make yourself a really high-end 0.965" diagonal (or really a 0.965"/1.25" diagonal) from Baader parts, plus a 0.965"/T2 adapter from Aliexpress. It'll be bigger than a common 0.965" diagonal, though. Pentax XP-8, it was designed for a camera projection. But still works nice, but the eye relief is a little tight. 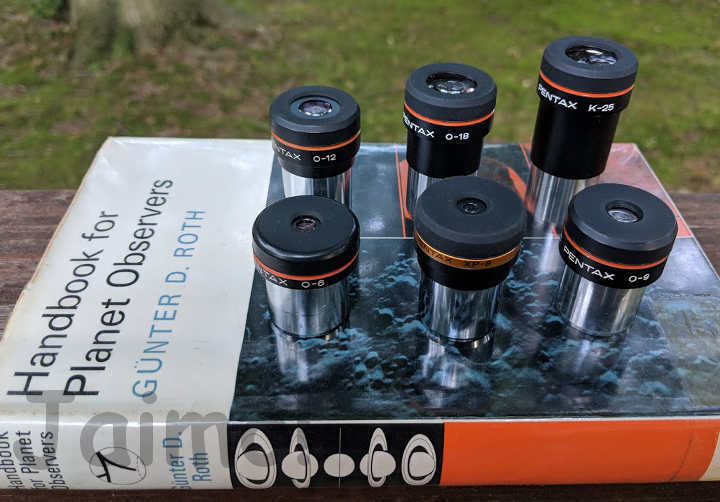 I think a cheaper route is to get a celestron 1.25" prism diagonals and then put an 0.965 to 1.25 adapter in the nose and then put a 1.25 to 0.965 compression adapter on top. May be a little heavy. Cheaper, yes, but also requires much more back focus. Edited by terraclarke, 03 November 2018 - 10:58 AM. Thomas, this is an 8mm worth looking for. 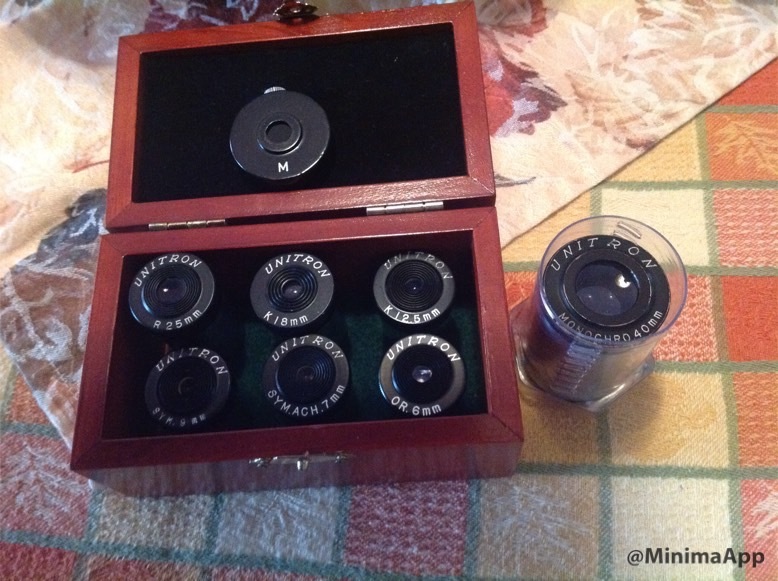 Nothing is stamped or labeled, maker or focal length. The body is delrin with a rubber eyeshield that has micro-focusing via diopter adjust. It is very light weight due to the construction materials. The camouflage pattern and diopter adjustment leads me to think that they were made for a spotting scope. The glass and coatings are very nice and the images are very sharp to the edge. I believe the design is a König, but I am not certain. The field is wider and sharper than a typical Kellner. This one was given to me several years ago but I believe Bill Vorce of Telescope Warehouse used to sell them. 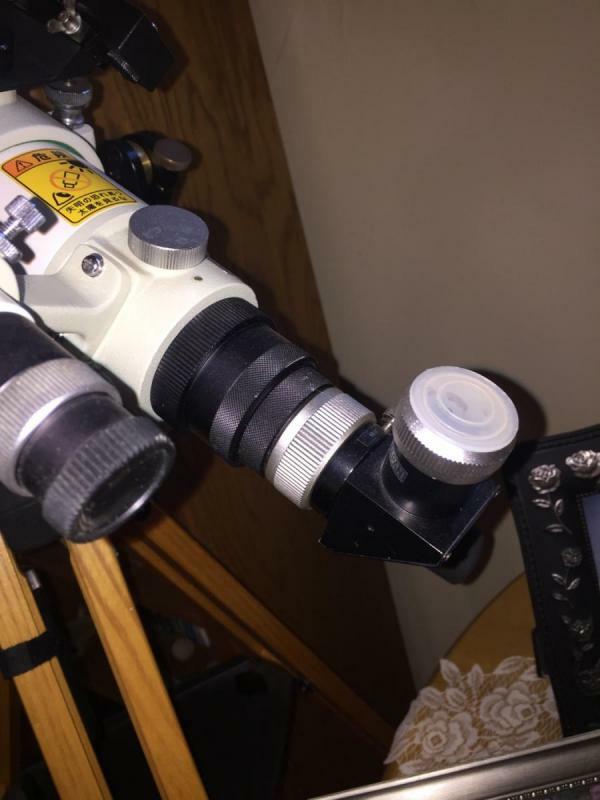 It is my only 0.965” 8mm eyepiece. My Carton 8mm Plossl is my only 1.25” 8mm. 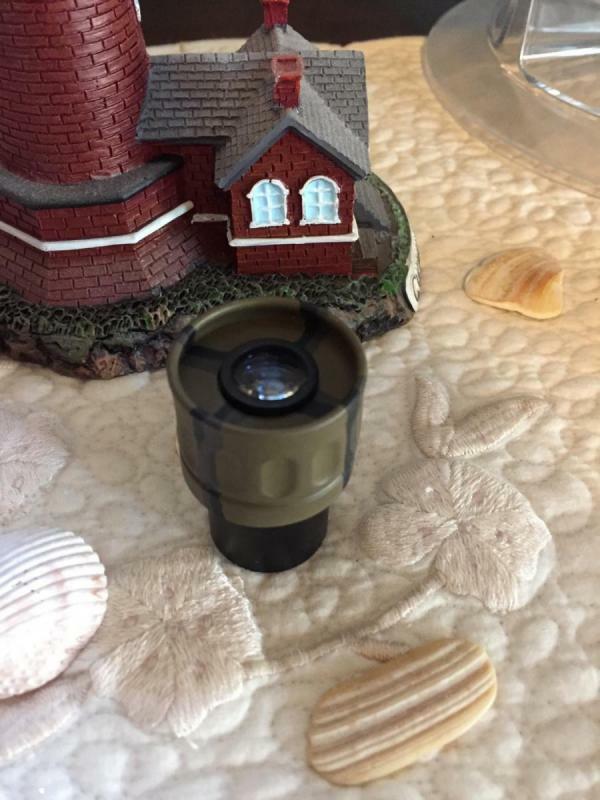 It's a former binoculars eyepiece (pocket compact binos). Konig. Have one I got from him.